3-Stage Under Counter Water Filter Max Flow - Brushed Nickel is rated 4.4 out of 5 by 149. 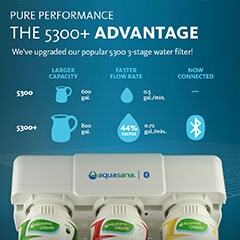 The Aquasana AQ-5300+ alerts you when it's time to change your filters. 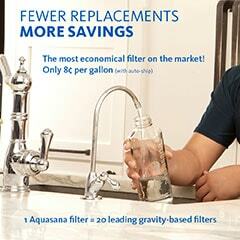 No more guessing if and when you need to replace your old filters. 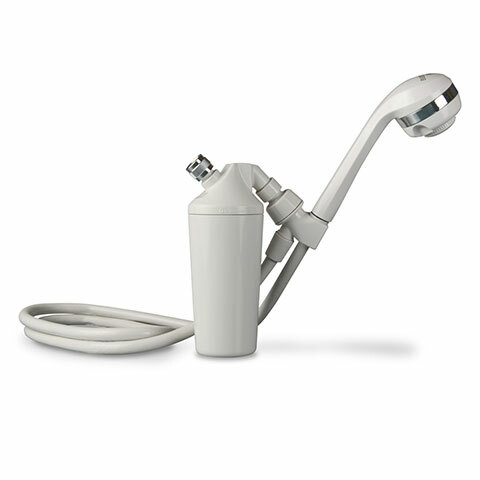 Rated 5 out of 5 by DarkMistress from Love my new fresh water, but tech needs work The installation process was difficult because our plumbing sizing did not match well with the Aquasana system. It required troubleshooting and a few trips to the hardware store, but we got it going! The water tastes amazing and the flow rate is great. Our only complaint is the tech/app is really terrible. I thought we would be able to track our filter life but I could even get my account set up on the app without crashing and my husband couldn't even get far enough to download it successfully. It's not a deal breaker, but very disappointing. Rated 5 out of 5 by Photontraveler from Photontraveler Very easy install. If you can follow the excellent directions you can install this product. We have hard well water and live in a rural farming area. but now my family and my pets love the taste of the water. Rated 5 out of 5 by Old Al from Great taste! Delivery was quick and so was installation. I already had an Amway water filter with similar connections hooked up. The taste was great. The only down side was even though I purchased the max flow 3 stage filter, it was slower than our old one stage Amway filter. Other than that, it is a great filter. Rated 5 out of 5 by Audrius from Easy to install and operate. I enjoyed the filter and it’s convenience a lot. I would improve on faucet quality : make the bottom metal part covering the hole a bit bigger. Rated 5 out of 5 by Caryn from Best tasting water I've had in years! Product was easy to install, good directions. It fit perfectly in the soap dispenser cutout in my sink. I would recommend to everyone. Rated 5 out of 5 by ZZZZ from What good tasting water tastes like The taste says it all. Our water system is a small resort owned operation. We have seasonal "spikes" in the chlorine added to the system because of the seasonal fluctuation of people and water flow. 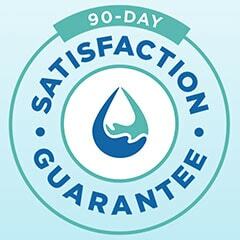 The Aquasana system has taken care of that. Installation was not a problem. Took about 3 hours. The only "surprise was the backflush/water noise it makes when it cycles and fills the reservoir. We have to plan and fill everything at night so my wife doesn't have to listen the noise it makes in the drain during breakfast. Small adjustment for water that tastes this good. 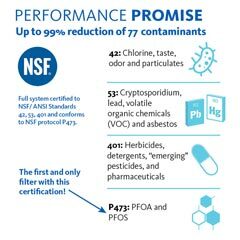 Rated 5 out of 5 by clean water obsessed mom from Fantastic filtration, slow flow We love this filtration system and installed it in our new kitchen 6 months ago because our city's water is full of chorine, chlorine byproducts and has been known to have other contaminants as well. The taste of this filtered water is better than bottled spring water and I love knowing my family is drinking clean, healthy water. It was super easy to install under the sink but the flow was really slow. Annoyingly slow. So our plumber installed a small storage tank in the basement on a rack attached to the ceiling. 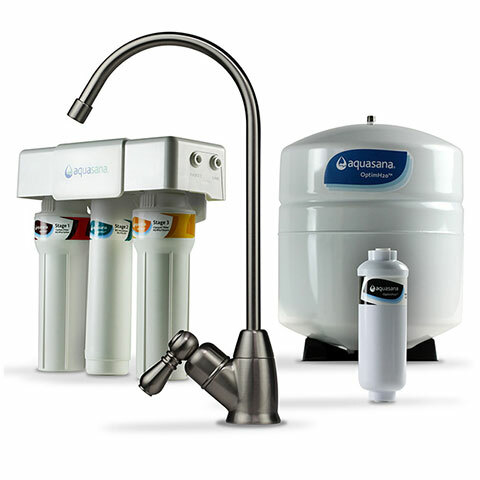 It's a reverse osmosis tank and stays filled with the filtered water from the aquasana system above so that when we turn on the faucet, the pressure is always strong. 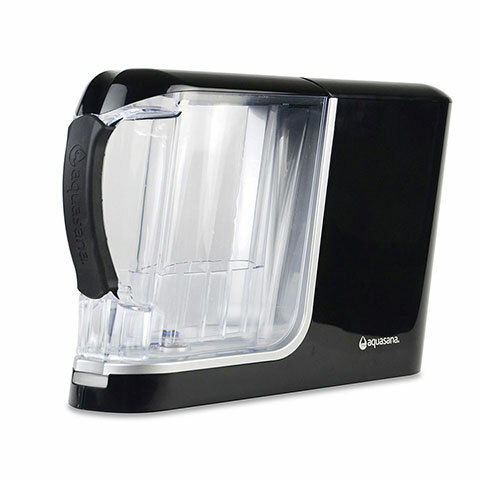 The kids can fill up their water bottles in a snap and a pitcher fills up as fast as from the main kitchen faucet. 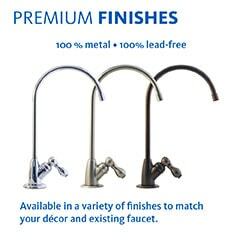 I also purchased a separate faucet fixture because I didn't love the look of the aquasana one. 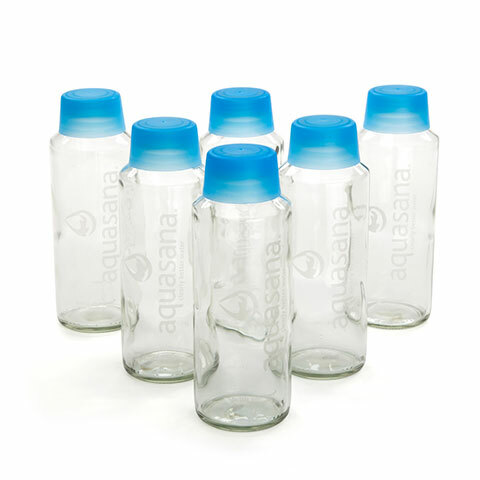 It ended up being the perfect set-up for us and I'd recommend the Aquasana system to anyone. Rated 5 out of 5 by Salvatore from Overall impression Easy installation, decent water flow, good taste and no odor or after taste. Can I avoid the faucet this system comes with? I have a commercial 3 compartment sink. 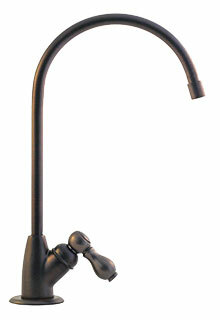 The faucet with Sprayer is mounted on the sink backsplash. I would want to use that faucet correct? What is the counter maximum thickness on which the AQ-5300+ can be mounted? 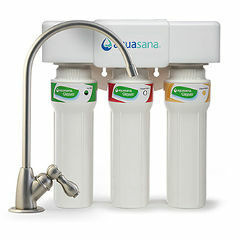 If I purchase an Aquasana Whole House Filtration system do I also need an under the counter system as well? It seems to me the whole house filter should be all I need. 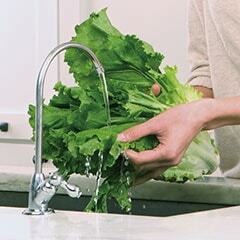 Depends on what you want to remove and the % of filtration of your water source. I purchased and use both. 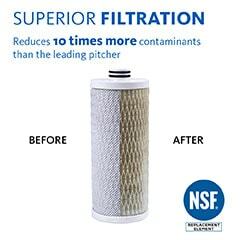 Where can I find the full list of contaminants this filters? What are the healthy minerals retained? 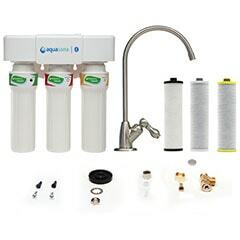 Can I use a water softener with the Under Counter water filter 3-STAGE MAX FLOW? I don't want to use an RO system if I don't have to. Why does water flow get so slow? 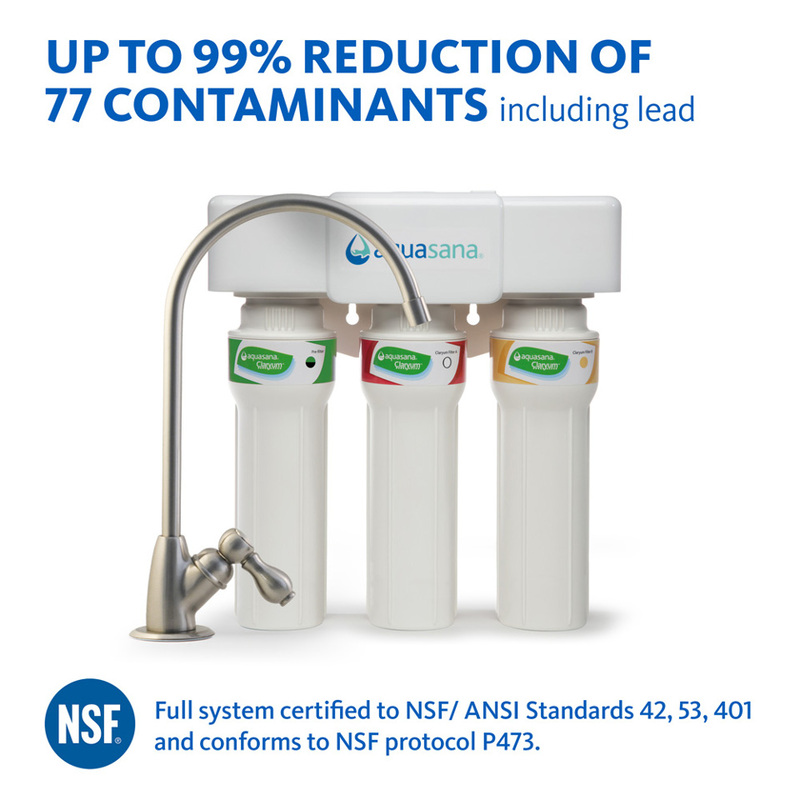 I have already purchased an air gap NSF certified faucet for our sink (thinking we were going to go with a RO system) however we don't have room for the tank. 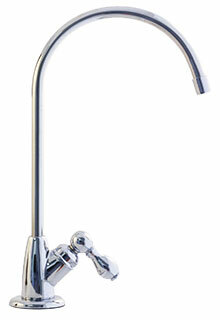 Will the 3 stage 5300 system work with the air gap faucet?